In December, following the line we opened in the last session of JoLabs in November, we will look at an introduction to robotics. We will see what robotics is and how it works. We will work with programming and hardware elements such as sensors, Arduino boards and actuators. 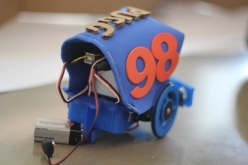 Every Saturday, we will create small-size robotic projects. Besides learning about subjects that include electronics, robotics or programming, we will work in groups using creativity and imagination and we will set our brain's hardware in motion! On 19 December, during the Eginzaleak! fair, young participants will have a chance to present and explain the projects they have created during the sessions.